Description: It is a feature-rich screenshot utility that can grab a selected area with a single key and then open them in an editor, save them to the clipboard, drive, and/or instantly upload them to 25+ different hosting services. 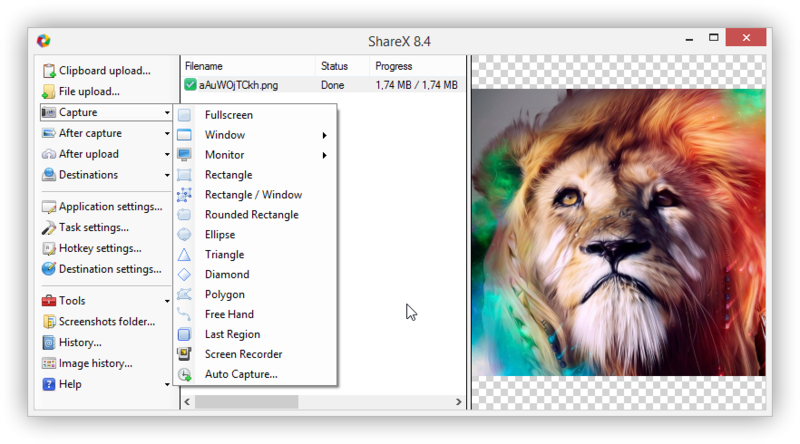 ShareX can capture screenshots with variety of shapes including rectangle, rounded rectangle, ellipse, triangle, diamond, polygon, and freehand. Supports screenshots with transparency and shadow, as well as adding a border, watermark, or resizing. In addition to images, the program can upload other file types, supporting clipboard upload and drag-and-drop. Additional tools include color picker, screen recorder (no-audio AVI or animated GIF format), and file hash checker. The "Annotate image" option opens files in the included Greenshot image editor.